It was a very beautiful and cool morning at Kundasang, Sabah. I woke up early taking photographs of the mountain. I saw the sunlight painted the mountain red for just a few precious minutes. Morning sun brighten up the mountain while keeping Kundasang Valley under the shadow of mountain. It was just over 6.10 am. I tried another shot. Both photos are taken with my iPhone 4's HDR Pro app. Most time of the day Mount Kinabalu is covered in the clouds, just like the photograph below. Morning before 8.30am is usually the best time you can catch a glimpse of the full view of Mount Kinabalu. The clouds cover Mount Kinabalu most time of the day except early morning. With a little bit of luck, you may see such view below. The clouds started to gathered after 7am. If you see such mountain view after 9.00 am, you can consider yourself lucky. Two photographs below were taken at about 5.30am. We can see the morning stars. I made a few serious mistakes taking both photographs. Morning stars above the peak of Mount Kinabalu. I went back to Sabah and Kinabalu Park again. This round I brought my family along and did not attempt climbing. We stayed at Kundasang in a resort and got a room with stupendous view. With this I will start a series of blog posts on visiting Kinabalu Park and its nearby places like Kundasang and Ranau. I hope you will enjoy the photographs and the writing. I am now back from the trip to Kundasang. My family have a good time visiting this peaceful and beautiful place. It has been an unforgettable trip. I am bringing my family to stay a few nights at Kundasang, Sabah. We are not climbing Mount Kinabalu this time. Instead we plan to explore the area around Kundasang. We have 3 nights and 2 days exclude the days we arrive and depart. I am really excited about it and now I am doing research on where to go and what to do in this area. In my past travelling to Kundasang I had only stayed at Kinabalu Park to climb the mountain. The only place outside Kinabalu Park that I had been to in Ranau District is Poring Canopy Walkway and its nearby hot spring pools that looks more like a few children swimming pools. Walking on the canopy walkway. Looking up to the canopy walkway. This is the lower part of the walkway. We have booked our accommodation, rented a car and ready to explore Kundasang and the places nearby. The first few tourist areas come to mind. We must visit the famous cattle farm which many say it looks like farm in New Zealand. A search on the net returned the farm name Desa Cattle Dairy Farm. I hope my son will like it. The Kundasang War Memorial seems prominent in the Google map. I would like to go Mesilau Nature Resort to explore for my next climbing trip. Of course we must spend at least half a day at Kinabalu Park. But first I have to find out where in the park that we can explore and do we need park guide like we climb Mt Kinabalu. And yes, I found from the net that there is a daily guided walk in Kinabalu Park. Here are the daily schedule of Kinabalu Park's activities.We should go. From the map, it seems there is a tea garden nearby, called Sabah Tea Garden. We must visit the vegetable wholesale stalls and local market place. This will require further research. For food, we will try Liwagu Restaurent. Maybe I should bring my family to Balsam too. Not that it is great but to let my family to experience my experience as a climber. I had tried and was not particular fond of the mee noodles at Tuaran. But I will definitely try to bring my family there since it is famous. A few more hours should be spent to produce a more concrete travelling plan. But for now, this should be okay for a start. This is one of the best video made on climbing Mt Kinabalu. The entire climb in 4 minutes. It is comprehensive, covering all important aspects of the terrain and timing. It is produced by a reputable tour agency, Amazing Borneo. Their setting in youtube allowed me to embed and share the video here. I link this post to their website since they produced such a good video. Quite amazing, indeed. 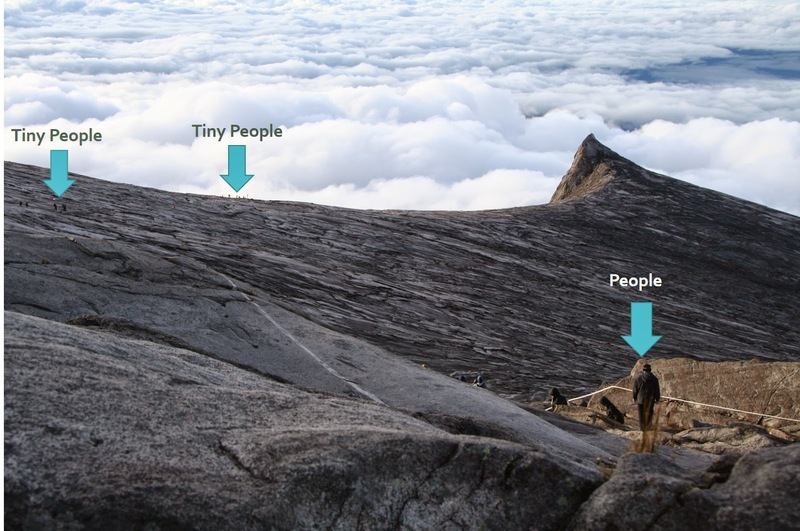 This is exactly how we climbed Mt Kinabalu, i.e. the timing and the terrain. Below is another good video on climbing the rope-holding zone. I added some of my climbing photos to this post as below. Standing at the highest point of the peak. Other climbers waiting for us to step down. The background is South Peak and St John peak. Clear sky beneath our feet. We can see the villages like looking into a crystal clear lake water. It was a truly amazing experience. Low's Peak is the highest point of Mount Kinabalu. The tip or the highest point of Low's Peak is a very small standing area with three little signboards. Low's Peak is a very busy place at dawn. You can see many climbers standing at the top of the peak. You can see climbers queuing to have their turn to stand at the highest point of the peak. Low's Peak can be quite congested with climbers at dawn. The highest point of the peak is a very small standing area that allows for, maybe, less than 5 people standing together at any one time. From the photo above you can see climbers climbed up to the tip point of the peak from one side of the slope (gradual slope at the left side of photo). The other side of the peak is a very steep granite slope. It is fenced with safety railing to prevent people to walk or stand too near to the edge. Climbers have to wait in a queue for their turn to step up to this small tip area of Low's Peak to take a few photo and feel their moment of "reaching-the-peak" achievement. And they step down in a timely manner for other climbers to have their moments. It is a busy area at dawn or before dawn when all climbers try to stay there as long as possible to take a few more photos or to see the sunrise. Climbers will stand behind or beside these three signboards above to take their photographs. Do you notice the safety railing at the left side of the photo? It prevents the climbers to stand too near to the edge. Below are a few photos of the surrounding taken at the highest point of the peak. The safety railing and the area behind the Low's Peak signboard. The area crossed over the safety railing/ fence. This photo was taken within the fenced area. It is dangerous to cross over the safety railing. The fence is meant to protect the climbers. For our own safety we should not take risk. Turn around. Looking at South Peak from the top of Low's Peak. Safety railing or the fence is at your left hand side now. Other climbers were waiting for you to step down so that they can have their turn to stand at the peak. Just follow the rope to get down to Laban Rata.